26th September 2014 | filed under Aesthetic Treatments, Face, Skin, Thermage. Your skin performs a number of vital functions, from helping to regulate your body temperature, to protecting you from your environment. Unfortunately aging is an unavoidable fact of life, and one of the most visible signs of ageing is the effects it can have on our skin. Indeed as we age, our skin can become less firm and tends to loses some of its elasticity, leading to the development of fine lines and wrinkles. There are a number of factors both genetic and environmental that can contribute to the ageing process, and one of the key underlying mechanisms involved in relation to your skin involves a common protein found in our bodies, known as collagen. Collagen is an essential protein found in our skin that acts as a key provider of support for your skin. 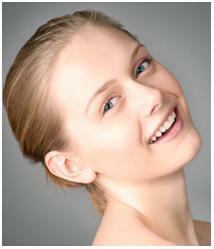 As such collagen plays an essential role in ensuring your skin remains smooth and firm. Hence one of the major reasons for the loss of firmness of our skin with age, and the development of wrinkles, is largely due to a breakdown of the collagen in our skin, which is naturally lost as a part of the ageing process. Hence it is important to ensure we take good care of the collagen in our skin. Whilst a loss of collagen is a natural part of the ageing process there are a number of steps you can take to revive the collagen in your skin and leave it feeling firmer. For example Thermage, also known as skin tightening and contouring, is a non-invasive cosmetic treatment that can help give your skin a firmer appearance. The treatment specifically targets the collagen in your skin and over time can lead to the production of new and remodelled collagen. Understanding how your skin works is vital to ensuring your skin remains looking its best. If you’re looking for Thermage, then here at the Aesthetic Skin Clinic we are skin care experts and can offer a wide range professional treatments including Thermage to suit your needs. For more information please do not hesitate to contact us and one of our friendly team will be happy to assist you with your enquiries. Aesthetic Skin Clinic Congratulate Obagi On Aesthetics Awards 2014 Success!